As many have noted, Trump's nonstop barrage of falsehoods has left those still grounded in some semblance of reality dazed if not numb: the normal tools of "fact checking" and presidential campaign coverage are simply not equipped to deal with such an unprecedented and daily departure from basic truth on the part of a major candidate. But the last two days have brought something new and far more depraved than anything we've seen so far, and it's important not to let this moment pass as just another case of Trump being Trump. The Orwellian brazenness with which Trump and his campaign have rewritten reality, in now casting Trump himself as the man who has done Barack Obama a "great service" by establishing that the president really "was born in the United States," is unlike anything seen in American politics in any our lifetimes. All politicians, like all human beings, shade the truth, use evidence selectively, recast the emphasis of events to cast themselves in a more favorable light. But what we are seeing here is a campaign that, with not one iota of moral conscience, has reached into the playbooks of Big Brother, Joseph Goebbels, and Soviet Russia and simply fabricated an entire false narrative. This is not a case of spin, or deceptive evasion, or clever rhetorical jujitsu; ut is not a case of the subtle or clever lie intermixed with the truth. Trump was the man who rode the "birther" movement to public attention. Nonstop, for weeks, he repeated every crackpot conspiracy theory: that Obama's birth certificate was a fake; that an official who knew the truth was murdered; that "a team of investigators" he had supposedly sent to Hawaii "cannot cannot believe what they are finding." As recently as three days ago he said he was not yet ready to say whether he believed Obama was born in the U.S.
Hillary Clinton's campaign first raised this issue to smear then-candidate Barack Obama in her very nasty, failed 2008 campaign for President. This type of vicious and conniving behavior is straight from the Clinton Playbook. As usual, however, Hillary Clinton was too weak to get an answer. Even the MSNBC show Morning Joe admits that it was Clinton's henchmen who first raised this issue, not Donald J. Trump. In 2011, Mr. Trump was finally able to bring this ugly incident to its conclusion by successfully compelling President Obama to release his birth certificate. Mr. Trump did a great service to the President and the country by bringing closure to the issue that Hillary Clinton and her team first raised. Inarguably, Donald J. Trump is a closer. Having successfully obtained President Obama's birth certificate when others could not, Mr. Trump believes that President Obama was born in the United States. Let alone that every single one of the assertions in that statement is a falsehood, the internal contradictions are just mind-boggling. 1. falsely accuses Clinton of raising the claim that Obama was not born in the U.S.
5. and ends it all by praising himself for having supposedly established that the lie he originally promoted for months on end was . . . a lie. As he said yesterday (after spending a hour promoting his new hotel on live TV), "I am really honored, frankly, to have played such a big role in hopefully, hopefully, getting rid of this issue." Clinton responded, "There is no erasing history." Yet that is precisely what Trump, in common with great dictators throughout history, is doing. If history is inconvenient, you invent a new history. It doesn't have to be true at all; it just has to follow a plausible story line that appeals to the prejudices and emotions of one's followers. And Trump's followers, even more alarmingly, seem to positively revel in their great leader's contempt for such elite niceties as being constrained by the truth. George Kennan, as an American diplomat in Moscow in the 1930s, once sent a cable trying to explain Russian behavior to Washington. "Russians," he noted, "are a nation of stage managers and the deepest of their convictions is that things are not what they are, but only what they seem." Trump's much-noted admiration for Vladimir Putin runs deeper than we might have realized. No one was more capitalistic than the Boston descendants of the Puritan founders of America. The old families of Beacon Hill were the captains of every money-making venture in the early years of the Republic: finance, trade, railroads, textile mills. Yet no one felt more keenly a duty to promote the general welfare: when Boston built the very first public libraries, hospitals, schools for the deaf and blind, universities, museums, and concert halls in the nation in the early nineteenth century, the wealthy citizens of the city reliably donated millions. In 1810, Dr. John Warren sent a circular letter seeking donations for the Massachusetts General Hospital: he addressed it to the "treasurers of God's bounty." Which presidential candidate (hint: he has "large numbers" on his physical exam) does that attitude toward wealth and societal duty not remind us of? As the Washington Post reported this week, Donald Trump's record as a treasurer of God's bounty has been to take from everyone and keep everything for himself. Despite his boasted billions and voluble public assertions of munificence, his only discoverable charitable contributions of note have been made entirely with other peoples' money. But this is of a piece with his larger contempt for the things that actually have made America great, the kinds of things that those earnest citizens of mid-nineteenth century Boston valued, and were proud of valuing. Trump's obsession—there is no other word for it—with ratings and riches as the sole measure of value would be simply pathetic were it not accompanied by an equally great ignorance of and contempt for science, the arts, law, history, morality, learning, and charity: in other words, the ideals and values that from the time of the Puritans to today have been the soul of what our nation has strived for in its vision of creating a new society built on justice, decency, and the advance of civilization. As such, it is not simply pathetic: it is frightening. To contemplate the destruction to America's values that a President Trump could wreak through his casual willingness to toss aside the principles, knowledge, wisdom, and values so painfully acquired, at great cost, over centuries is the most alarming aspect of what we're facing in this election. For more than two centuries, America led the world in bringing the civilizing rule of law to the conduct of war. The United States fought both on the battlefield and at the negotiating table to affirm the right under international law of neutral nations to safe passage and free trade during wars (one of the causes America fought for in the War of 1812); to hold soldiers accountable under military law for the mistreatment of enemy civilians or theft of their property (a policy instituted by General Winfield Scott in the Mexican-American War, which earned the United States the admiration of the world and was widely recognized as an advance for justice and humane behavior); to require proper treatment of POWs (embodied in the Geneva Conventions); to outlaw the use of chemical weapons, land mines, and cluster bombs that pose an inhumane risk to civilians. Subsequent generations of American statesmen and military leaders saw that not only honor and justice, but basic practicality, was served by advances in the law of war: that it is American POWs who will suffer too when combatants descend into torture and reprisal; that even a defeated foe will fight to the death rather than surrender is he knows he will be mistreated if captured; that every civilian death and every abuse of enemy property undermines the justness of the cause and the reputation of America in the eyes of the world, and thus makes the soldier's job that much more difficult. This is what a President Trump would toss aside with two words off the top of his head, and with arrogant ignorance of any larger principle at stake beyond sounding tough or revving up a crowd of followers. With the same disdain for any actual knowledge (after all, he has "a very good brain") that informs his "views" (if they can be called that) on vaccines, global warming, trade restrictions, counter-terrorism strategy, nuclear weapons, the Constitution, and health care policy, he has blithely called for torturing enemy prisoners, plundering Iraq's oilfields, and "freeing" the military from "the Geneva Conventions, all these rules and regulations" that make "the soldiers afraid to fight." And don't count on the weak comfort that those around him will somehow prevent him from carrying out his instant insights: the utter cravenness of his acolytes was perfectly on display this week when his minion Rudy Giuliani scurried to second Trump's nostalgic assertion that (referring to his insistence that America should have seized Iraq's oilfield for itself) "it used to be to the victor belong the spoils." Giuliani chimed in by affirming that "anything is legal” in war. Actually, that doctrine—encapsulated in the medieval Latin maxim Inter arma leges silent (in time of war the law is silent)—began to go by the boards about 600 years ago, when admiralty courts in the 14th century began asserting jurisdiction over the legality of captures of enemy ships at sea. It has been completely cast aside in the last two centuries by Winfield Scott's General Orders No. 20, the Treaty of Paris, the Geneva Conventions, and the U.S. Code of Military Justice. Those were things America at least used to be proud of. It's no coincidence that Trump knows literally nothing and cares nothing about the worlds beyond fame and fortune, in which he has succeeded by bluster, braggadocio, hype, and shortchanging small tradesmen and investors alike. His sole measure of the worth of what a commentator has to offer is what his ratings are. His sole measure of the greatness of a foreign leader is what his poll numbers are. His sole measure of scientific truth is what assertions on Twitter get a lot of responses. His idea of a "university" is a place to soak people with a get-rich-quick scheme. His idea of charity is taking credit for others' generosity. His idea of culture is a resort decorated like one of Saddam Hussein's palaces. And his idea of the Constitution is something to say he's really, really for, without apparently having read or understood the principles it embodies. Now available -- just published! . . . Author, historian, and journalist Stephen Budiansky (www.budiansky.com) has published 17 books of military and intelligence history (Battle of Wits; Perilous Fight; Blackett's War), biography (Her Majesty's Spymaster; Mad Music), and science and nature (The Nature of Horses; The Truth About Dogs). 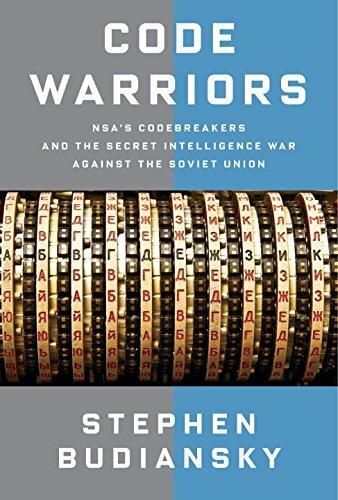 His latest is Code Warriors, a history of cryptology and NSA in the Cold War, published by Alfred A. Knopf.